Where Can You Access Free Community Wi-fi? 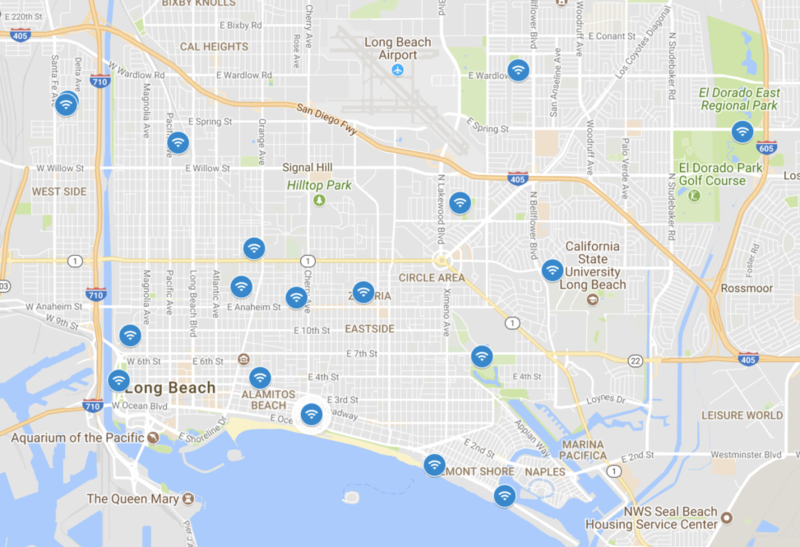 In ASK LBMC, a part of the Long Beach Media Collaborative’s Strengthening the Signal series, our reporters answer your questions about the digital divide in Long Beach. To submit your question or vote on what the next question we tackle will be, click here. Many of the city’s parks and community centers can and do provide the public with free Wi-fi, helping to bridge the digital divide for the 16% of residents who lack access at home. And there’s more work being done to increase connectivity in Long Beach, with city leaders on the verge of unveiling a Fiber Master Plan to improve the fiber network and otherwise upgrade outdated digital infrastructure. It’s a potential $88 million move that could connect more city facilities to high-speed internet. Free access also is found at City Hall, the 12 branches of the Long Beach Library system and at the Long Beach Airport. Beyond those sites, one North Long Beach neighborhood has been transformed into a “smart corridor” called UpLink, offering city-provided internet service at five access points along Atlantic Avenue between Jordan High School, Houghton Park and the Michelle Obama Library. “It’s the first step in using technology as an economic development tool to activate a corridor,” according to Vice Mayor and Ninth District Councilman Rex Richardson, who allocated one-time infrastructure funds last year to pay for the project based on participatory budgeting. Besides that corridor, there are no other city streets or official business improvements districts offering free Wi-fi in the city, but many private businesses do offer it as a complimentary service for customers, particularly at local coffee shops, fast-food chains and restaurants.